If your friends are constantly bitching about how movies use too much CGI then point them to “War for the Planet of the Apes.” It has some of the most impressive CGI work in a film to date. I still can’t believe I sat there for over two hours watching computer generated apes and laughed, cried, and had an unbelievably thrilling time. One part revenge thriller, one part POW drama, “War for the Planet of the Apes” is a thrilling spectacle for the eyes and ears. The final (?) entry in this “Planet of the Apes” prequel series ends on a total high note and, like the apes onscreen, has evolved into an intelligent and fascinating allegory about the dangers of technology all wrapped in summer blockbuster fun. 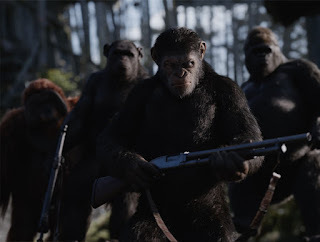 “Rise of the Planet of the Apes” was a terrific jumping off point for this trilogy and set the pace for what has become such a fascinating series to see evolve. In that film we see how Caesar, a chimp that has gained massive intelligence to the point where he can actually speak, lead various apes on a quest to take over the world (or at least initially San Francisco). The series took a darker, more depressing turn with “Dawn of the Planet of the Apes” a perfectly fine film that to me felt less engaging than the first entry. It was with this hesitancy that I entered this third film but was completely blown away.